North Korea launched an intercontinental ballistic missile towards Japan early Wednesday morning. The missile reached an altitude of about 2,800 miles, with initial estimates saying it will be the highest altitude reached by a North Korean missile. In the last two decades, North Korea has launched more than 40 missiles in major provocations, with around 30 in the last two years alone. Beginning in 1976, North Korea began developing missiles using Scud-B from the Soviet Union and launchpads from Egypt. Through the 1980's and 1990's, it began testing additional missiles, like the Rodong in 1990, and the Nodong-1 missile in 1993. North Korea launched its first ballistic missile, the Unha-1 rocket, in 1998, and has since made significant advances both with nuclear warheads and with ballistic missiles. February 12: North Korea successfully tested a Pukguksong-2, missile, a new intermediate-range missile. It was the first missile launched into the Sea of Japan since US President Donald Trump took office. General John Hyten, the commander of US Strategic Command, said this launch marked a significant advancement for North Korea. North Korea names its missiles Pukguksong when they're meant to fire from submarines, and Hwasong when they're meant to fire from ground launchers. March 6: Four ballistic missiles were fired from the North Pyongan province, near China's border. The tested missiles flew 620 miles (1,000 kilometers) before landing in the Sea of Japan. The US also began installing the a missile defense system (THAAD) in South Korea as protection against missile attack from the North. March 22: North Korea tested a mobile-launched missile that exploded within minutes of taking off. The type of missile launched was not confirmed. The launch signaled increasing frequency of North Korean missile testing. April 5: A ballistic missile was fired ahead of a summit between US President Donald Trump and China’s President Xi Jinping in Florida. Discussing North Korea’s weapons programs was high priority for the leaders' meeting, raising speculation that the launch might have been timed to get their attention. April 15: North Korea launched a KN-17 intermediate range missile that exploded shortly after launch. The failed launch coincided with a massive military parade to commemorate the 105th birth anniversary of Kim Il-sung, the country’s founder and grandfather of current leader, Kim Jong-un. May 13: An intermediate range Hwasong-12 ballistic missile lands in the sea near Russia. Japanese Defense Minister Tomomi Inada said at the time that the missile could be a new type. It flew for 30 minutes before dropping into the sea. May 21: North Korea fires the Pukguksong-2 missile, which flew for 300 miles (500 kilometers). The day before the missile launch, North Korea said it had developed the capability to use nuclear-tipped missiles to strike the US mainland, although Western missile experts said at the time that the claim was exaggerated. May 29: A short range Scud-class ballistic missile was fired and flew about 280 miles (450 kilometers). North Korea has a large stockpile of the short-range missiles, originally developed by the Soviet Union. June 8: North Korea test-fires four anti-ship missiles, making it the fourth missile test in a month. "We assess that North Korea intended to show off its various missile capabilities," Roh Jae-cheon, a spokesman for South Korea's Joint Chiefs of Staffs said. July 4: Kim Jong Un celebrated the country's first launch of an intercontinental ballistic missile. North Korea has a history of conducting weapons test on or around July 4, America's Independence Day. Kim said the US would be "displeased" to receive a "package of gifts" on Independence Day. July 28: North Korea launched a second ICBM, called the Hwasong-14, that Kim said demonstrated his country can hit the US mainland. North Korean media said that Kim expressed “great satisfaction” following the launch, and said the missile is capable of delivering "a large-sized, heavy nuclear warhead." August 26: North Korea fired three short-range ballistic missiles amid US-South Korea joint military exercises. A day before the exercises, Pyongyang warned the US was risking an "uncontrollable phase of a nuclear war." August 29: North Korea sent a missile over Japan's Hokkaido region, causing panic. The missile was thought to be the first nuclear-weapon capable ballistic missile the North has ever sent over Japan. 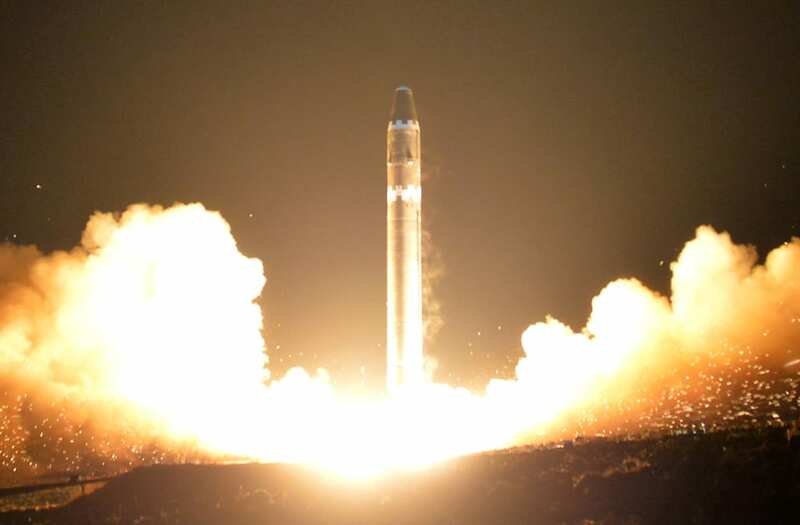 September 15: An intermediate-range ballistic missile was fired over Japan, marking the first launch since the UN imposed fresh sanctions on North Korea. The day before, North Korea threatened to sink Japan and turn the US to "ashes and darkness"because of the two countries spearheading of the imposed sanctions. November 29: North Korea fired an intercontinental ballistic missile that traveled about 1,000 kilometers, or over 620 miles, and landed in the Sea of Japan. The missile reached an altitude of about 2,800 miles, and early estimated say it could be highest altitude reached by the country's missile program so far.